One thing has been missing from the discussion of resonance. What’s the point? Who cares if we can write out resonance structures? What does it matter if we can figure out the two or three most stable resonance structures? So what? 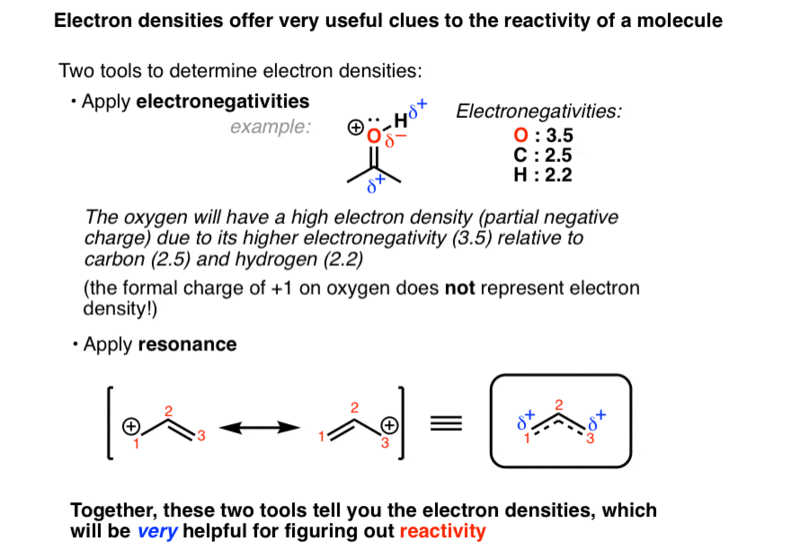 Here’s the point: we can apply resonance (and electronegativity) to figure out the electron densities of molecules from first principles, and we can apply these electron densities toward understanding how a molecule will react. Put it another way: if you learn this skill, you will rely less on memorization for understanding reactions, because you’ll be able to figure out the chemical behavior of molecules you’ve never seen before. 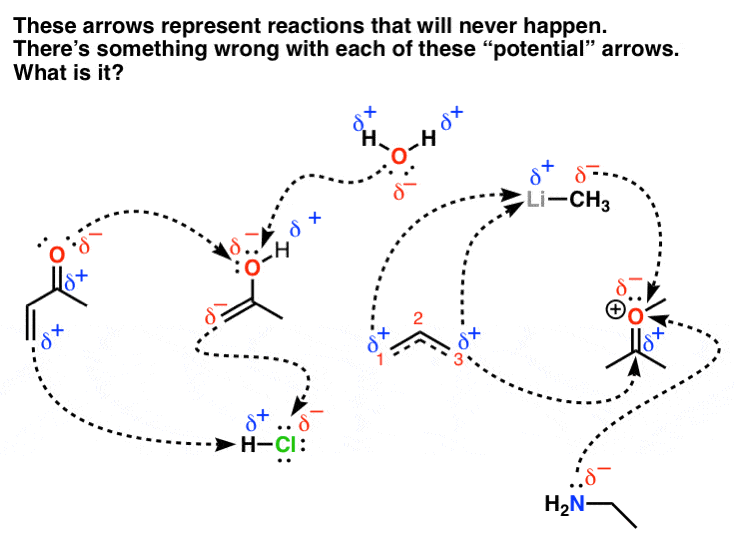 For instance: if you’re a non-chemistry major I can pretty much guarantee you’ve never seen this reaction before. But if you apply some of the principles in this post, you should be able to make some headway on it. Let’s look at these two aspects really quickly. Applying electronegativities. When you have a bond between two atoms with different electronegativities, there will be a dipole (two opposite charges separated in space). That dipole will give you a clue about the electron densities of those two atoms. For example in the molecule below, the oxygen is more electronegative than carbon which means that the C–O bond will be polarized towards oxygen (it will have a higher electron density). This is different than formal charge, which is where we have to assign a charge to an atom for “accounting” purposes. Applying resonance: when you know the most stable two (or three) resonance forms, you’ll have a good idea of what the resonance hybrid looks like. The resonance hybrid also tells you electron densities, sometimes in a way that isn’t immediately apparent from electronegativity (see below). Here’s some examples of resonance hybrids, along with the electron densities we get from applying both electronegativity and resonance. In the picture, the partial charges (δ) represent electron densities on the hybrid. Now for the punch line. Once you know the partial charges on a molecule, you can then use it to figure out potential chemical reactivity. How so? Remember the “one sentence summary of chemistry”: opposite charges attract, like charges repel. So any region of negative charge on a molecule will have some degree of attraction to a region of positive charge on another molecule. In reactions electrons flow from areas of high electron density to low electron density. Another way of putting it: the partial negative charge (i.e. high electron density) will go to a region of partial positive charge (i.e. low electron density). 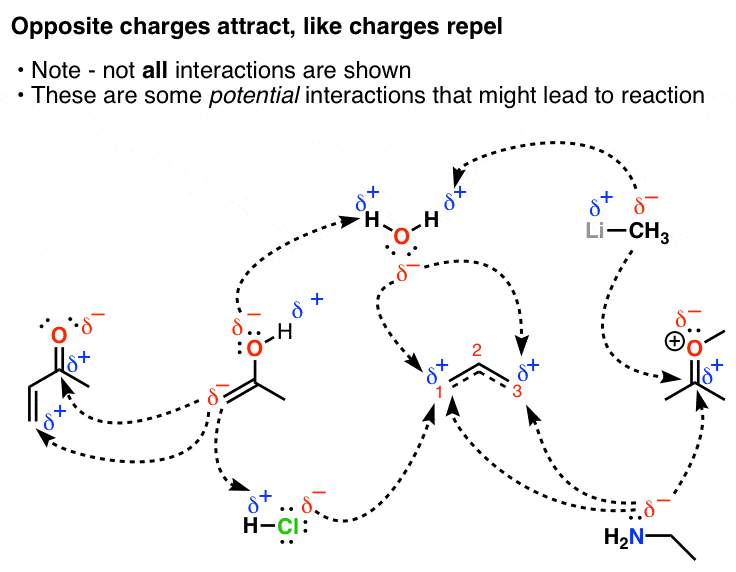 So in the diagram below I’ve put down some of the resonance hybrids (along with other molecules), and drawn a selection of the interactions between the opposite charges. 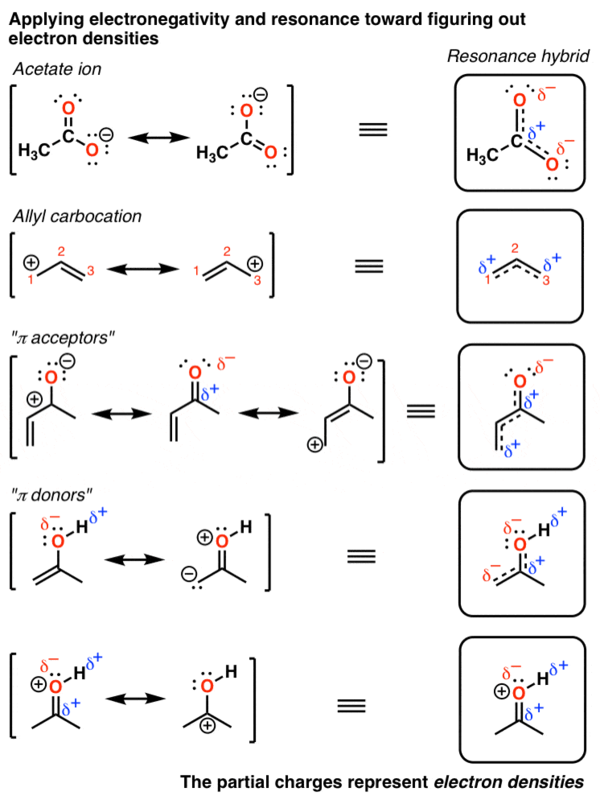 Although these arrows do not necessarily represent actual reactions (although many do!) they at least represent potentially feasible reactions. 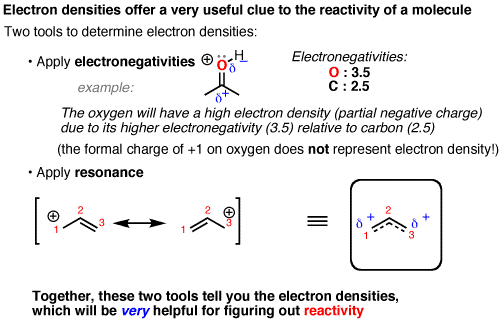 The key take-home skill from these examples is to be able so see how the resonance hybrid will determine electron density, and how this can end up leading to hypotheses for feasible reactions. 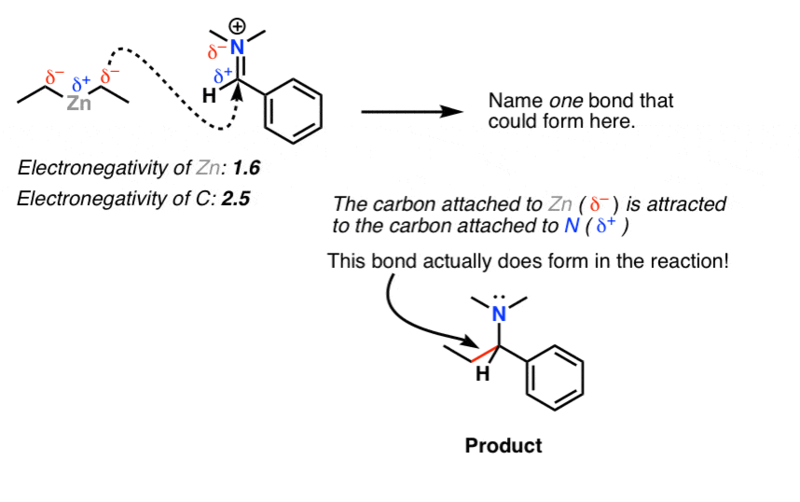 By applying electronegativity, we can judge that the C–Zn bond will be polarized towards carbon, which makes it electron rich; it should be attracted to the carbon of the second molecule, which both electronegativity and resonance tell us should bear a partial positive charge. In fact this is a real reaction, although we can’t fully determine how well a reaction will work from first principles. Experimental evidence is the one and only arbiter as to whether a reaction works or not. Is this technique perfect, without exceptions? No. It’s not perfect. It’s not completely without exceptions. * But it’s a good mental model for the underlying principles of chemical reactivity. The point here is to give you a glimpse of how to apply the concepts of electronegativity and resonance towards new and unfamiliar situations. *Two prominent exceptions: electronegativity isn’t the best for figuring out the reactivity of nitrile ion (CN(–) and oxymercuration of alkenes. It doesn’t predict reactivity of Cl-Cl and Br-Br, etc. which are not polarized. **Note that this model doesn’t tell you how reactive different species will be. That will require another set of mental models. PS – a long enough post as it is, but here are some “unproductive” interactions from the diagram above. True, I didn’t include the specific details of the arrows because they hadn’t been introduced in this series yet and the exact details weren’t important ; just wanted to show that this was a *plausible* reaction. Sorry if this wasn’t clear. thanks for this topic. It is good. Thank You! I think this is something that confuses a lot of students. Great article, very nice summary. I’d love to see more examples of working through the logic of where the electron density is. This is essential for understanding how and when reactions will take place. Talked about it a bit here, but it didn’t involve resonance.